The New FDO is here! FDO now features a global search bar and integrated results page to address all your prospecting needs. One search bar allows you to simply enter a phrase describing your work. When you enter a phrase that describes what you’re looking for, or search by Advanced Search & Filters fields, you’ll now receive the full range of data on grantmakers, grants, recipients, and 990s in one results page. One results page allows you to efficiently compare grantmakers, grants and recipients before you dive deeper in evaluating funders, so you can hit the ground running in building strong prospect lists. With a growing source of grantmakers, grant and recipient data, you can now get results, trend insights and funding summaries tailored to your field of work based on your search criteria. 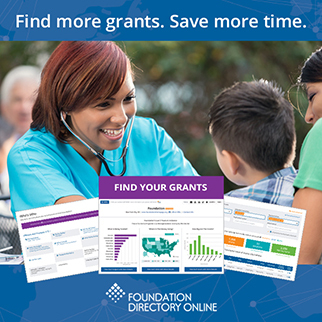 For the first time, see how much funders are giving to your cause based on your search criteria with Amount Funded in your grantmaker search results. Enhanced visualizations provide context to your funding search and allow you to see prospective funders’ giving trends and their suitability to your funding needs. Here you’ll be able to gather key insights on how to approach funders, like how much to ask for from specific funders. FDO provides lists of key decision makers and their affiliations. Turn insights into action: see who can make an introduction to prospects with FDO’s LinkedIn integration. Never miss a funding opportunity, past or present. FDO further personalizes your prospect research by identifying when a grantmaker has previously funded your organization, so you can rekindle support from organizations who believe in your work. Explore other potential funders available within each grantmaker profile— these are grantmakers with similar giving patterns to your search that you might not have otherwise evaluated. Peer recipient profiles can give you ideas on new grantmakers to explore and insights on the funding mix of organizations like yours that can help you shape your funding strategy. FDO is also mobile-friendly, so you can keep track of your prospects anytime, anywhere. These are just some of the powerful features you’ll experience and that we will continue to improve upon. The new FDO delivers increased speed and ease to build your prospect funder pipeline, grow your connections to funders, and gather the grantmaker and grant insights you need to successfully identify and approach funders that are a good match with efficiency and agility. As the FDO team continues to bring you the highest quality prospect research experience, we look forward to you getting the most out of these new features and enhancements! Getting a list of prospective funders has never been easier. FDO’s integrated search option will increase the speed and ease with which you search. The new FDO also provides you with what you’re looking for in one fell swoop, delivering grantmakers, recipients, grants, and 990s in one integrated results page. With one search you can be well on your way to growing your prospect list. The new FDO is so much more than a new interface. For the first time ever, you’ll be able to see how much funders are giving to your cause based on your search criteria. The amount funded will indicate how much the grantmaker distributes to your area of interest, allowing you to see who are suitable funders and where they focus their priorities. Easy-to-read, interactive charts and maps highlight key funding information that provide context to your funding search, so you can quickly understand grantmakers’ giving trends to efficiently find funders that align with your mission. Drill deeper to gather additional insights to help you effectively determine the grantmaker’s suitability to your funding needs, and solicit grants. Realize the full potential of FDO with FDO’s LinkedIn tool. Within each grantmaker profile, you can see who works at the grantmaking organization and who you’re connected to – a LinkedIn icon will appear next to those you are connected to. Introductions are one of the most effective ways to get on a funder’s radar. Find out who in your network might be able to connect you to the funder. Each profile provides you with additional funders that share similar priorities and patterns of giving. These other funders to consider are based on subject, geographic area (where the funding is going), and the dollar amount of grants awarded. When was the last time a past funder issued your organization a grant? Are you new to the organization and don’t have a list of all previous funders? The new FDO not only allows you to discover new prospects, but will identify past funders of your organization for you, so that you are prepared when you connect with funders and can ensure the ongoing support from organizations that believe in the work that you do. You may notice next time you log into FDO a message prompting you to update your profile information if you haven’t done so recently. We’re asking for two reasons: For one, it’s always a good idea to make sure we have up to date contact information so we can better serve your account for billing and other issues; for another, we recently added a few new fields to signups. These fields, including information on organization type, size, and subject area, help us understand our users better so we can continue to build a service that best meets the needs of its users. Please take a moment to go into the Account area, click Update my Profile, and make sure your profile is up to date. Last summer we began offering new subscribers the option of subscribing to an annual plan paid in monthly installments, while still maintaining the existing monthly, annual, and biannual plans as well. If you choose this new option, you are agreeing to maintain your subscription for 12 months – just like an annual subscription – making monthly payments at a lower rate than the regular monthly plan. While you are subject to a penalty fee if you cancel early, that fee will never be more than three months’ payments in total. We have now added that plan as an option available as an upgrade option for existing subscribers. If you are interested in moving your monthly subscription to this new annual contract plan, simply go to your Account area and select Upgrade. You will get information on the contract plan, pricing, and the early-termination penalty. You will have access to all the same features and data in your current plan; only your payment terms will change. As always, please keep an eye on this blog for information on new FDO releases as well as search techniques and other valuable fundraising tips. Update Central is currently undergoing significant system maintenance and bug fixing. Owing to this, Update Central emails and state reports are unavailable and the data in the monthly table is not being updated. Please check back next month (February 2016) when this work should be complete. We apologize for any inconvenience in the meantime. Update Central is an FDO feature available to Professional subscribers that allows you to see new grantmakers, grantmakers with recent changes to their profiles, and high-growth grantmakers. Users can see monthly totals for those funders, create an alert to receive the monthly totals by email, and run reports to see funders for the above categories by state. We will post occasional - usually biweekly - release notes in this space collecting new features, recent fixes, and other changes. The default sort order for grantmaker searches is now Total Giving, from highest to lowest (was previously alphabetical). Company search (Pro only) remains alphabetical; grant searches are now Year Authorized, most recent first; and 990 searches are year, most recent first. The site will "remember" any change to the sort options on any search screen, so if you prefer another sort option, simply set it once and the site will use it for future searches. Fixed an issue where irregular site traffic caused error messages on searches and slow site performance. Database update transfers remain paused while new databases undergoes testing. This week our data team is moving all of our grantmaker and grant data from one database to a new one. This change will help our editorial and other back-end processes work more smoothly and efficiently and will have no direct effect on your use of Foundation Directory Online or our other data products. To give the team time to do all the necessary work and to fix any behind-the-scenes bugs, we will delay the next data transfer to FDO. Typically, we push an update to FDO once a week. To accommodate this change, we will delay our next transfer for two to four weeks, depending on how quickly the system is ready to go. It means the content and functionality will not change at all during that period. It also means that any newly added grants, 990s, or funders will not appear in FDO until after the next transfer, so if you are subscribed to any FDO email alerts, you will not receive them in the meantime. I will update this message once the transfer occurs, after which regular weekly transfers will resume. Today we're proud to launch a brand new suite of features for FDO: Workspace. With Workspace, you finally have a place within the FDO site to work with the funding prospects you identify. Assess how strong the match is between funders and your organization and programs; manage tasks, contacts, and notes; and keep track of progress toward your fundraising goals. To get started, just log in to your FDO account and find the Workspace link at the very top of the screen. If you have questions, visit the Workspace FAQ section in Help. Today is the release of the Beta version of the site, with more features coming soon. We know people will want to import and export certain content, and we're looking at even more features in the coming weeks and months, along with continued improvemnt of core FDO features as well. For now, give Workspace a try and let us know what you think! Join us for a live webinar on February 17, 3-4PM EST.We'll introduce Workspace, guide you through its features, and explain all its benefits. We’re celebrating the 15th anniversary of Foundation Directory Online (FDO) by offering 15 insider tips, secrets, favorite searches, and other hints to help you get the most out of FDO. I’ve asked Foundation Center librarians, trainers, and editors for their ideas and contributed some of my own. I’ll share them with you in a three-part blog series, starting with today’s post. You’re welcome to e-mail me for more information about any of these or to share your own. If you’re looking for corporate funders, do a Search Grantmakers search for Type of Grantmaker: “company-sponsored foundation” OR “corporate giving program”: This will give you a list of private or public corporate funders. Also, if you’re focusing on a specific company, do a Search Grantmakers keyword search for the company’s name. Searching in Keyword instead of the Grantmaker Name field will return more results, which could be helpful if you’re trying to get a fuller picture of a company’s philanthropic activities. I like using Power Search to capture insights on how organized philanthropy has responded to current events. For instance, searching “Obamacare” OR "affordable care act" in Power Search reveals hundreds of grants, news articles via Philanthropy News Digest, and direct access to foundation-sponsored reports and case studies via IssueLab, all in one search. Just now, I searched Ebola and was able to download results of foundations making grants to fight the Ebola outbreak. If someone is researching a topic that does not fit neatly into one of the Fields of Interest/Subjects terms in our search indexes, I suggest starting with Search Grants and entering the term(s) in Keyword. Then, I look at the Subject terms that Foundation Center uses when indexing those grants. (Only about 5-10 records need to be reviewed to get an idea of which terms the Center uses). It's a helpful way to discover Fields of Interest/Subjects that can then be used for searching both the Grantmaker and Grants areas of FDO. Speaking of the Fields of Interest/Subject/Recipient Type search indexes, those are very long lists of terms that can be a challenge for newer users. A few months ago, we added a feature to index search to help make that process easier. Look for the mini “filter box” at the top of the index, right above the alphabet menu, and start typing your search term. This will filter the choices to matching terms, and you can then select one or more of those, saving you time from hunting through the whole list letter by letter. Print/bookmark the full list. Mark it up! Highlight terms that describe your mission, programs, population served. Or answer these questions: 1) Who are you serving? 2) What are you doing for them? The more terms that you can use to describe your project, the more funders you’ll find in FDO. Try these out, and we’ll be back next month with five more! And, please share your own favorite tips and techniques! Not an FDO subscriber? Now’s a great time to get on board so you can use these tips: until 11/30 1/31, new monthly subscribers can buy 3 months and get 1 additional month free! Plus, you’ll get a free FDO training webinar valued at $69. Select “Special Offer” at checkout! As you've no doubt noticed, Foundation Directory Online has a new look! But while the site's appearance may have changed and there are some more changes "under the hood," rest assured the way you use FDO day to day remains the same. Guided search functionality: With our new and improved index filtering options, you can find the perfect search term as you type. Plus, new ways to narrow your results lets you drill down to the right list of grantmakers with fewer searches. Printer-friendly grantmaker profiles bring information from our database to your desk more easily. The ability to e-mail lists of grantmakers and groups of grantmaker profiles gives you more options for taking the data out of the database in the way that works for you. Mobile-friendly: The FDO site is now responsive, so you can easily use the application on tablets and smart phones. Secure site: FDO will now live on a secure web site for added privacy. No need to update your bookmarks; you'll go right to the new secure site. We welcome your feedback on the new site, and we're committed to continued improvements to meet users' needs. Feel free to email us using subject line "FDO Refresh" with your feedback and questions.